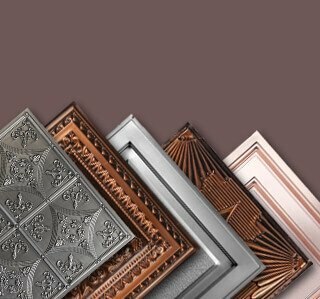 Whether you're looking for drop in tiles for a suspended ceiling, or direct mount tiles to glue up, you've come to the right place. 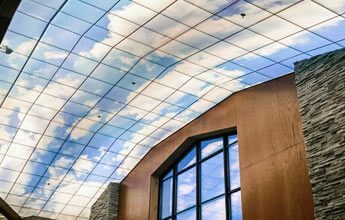 Most of our ceiling tiles are 100% waterproof and many are certified for use in commercial and industrial applications. Browse our full line of 2x2 tiles. 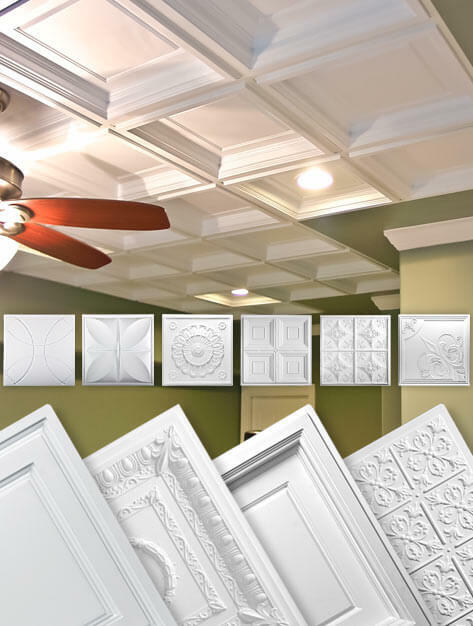 We carry several 2x4 ceiling tiles in designs that replicate the look of the 2x2 trend without the need to retrofit your existing installation. We also stock several styles that continue the traditional 2x4 look and feel allowing you to maintain a harmony with existing installs. ProSERIES ceiling tiles are highly recommended in zones that are more demanding than typical homes and offices. 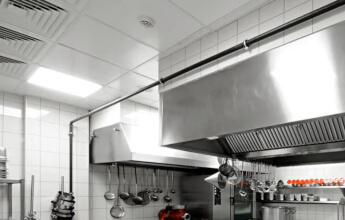 They excel in commercial areas like; food prep areas, mechanic shops, manufacturing plants, and areas of high humidity 100% waterproof & Class A Fire Rated. 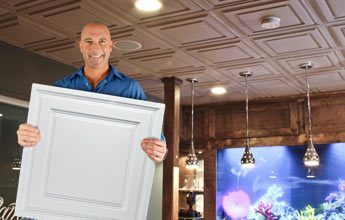 Our Stratford ceiling tiles are 100% Waterproof, flexible, easy to install in tight spaces, available in 12 different colors, and feature an attractive contemporary design that will compliment any space. Comes in 2x2 and 2x4 sizes for drop in grids. Browse our full line of waterproof tiles. Stunning custom printed ceiling murals designed specifically to fit your space. 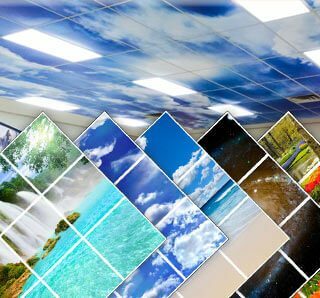 From open sunny skies to comforting forests or waterfalls, our Imagination Ceiling Tiles can take your space to new heights. Browse our full line of available images. 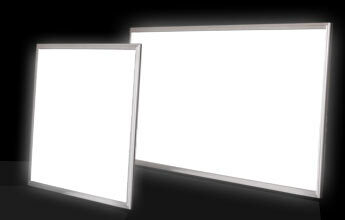 LED panels are a direct drop in for t-bar/suspended ceilings and offer up to 60% savings over conventional lighting. Their long lifespan (approximately 50,000 hours) makes them desirable in applications where low maintenance and operational cost is desired. "We have had nothing but compliments on our new ceilings. Our house was tremendously damaged in a tornado May 2015. When renovating we put in all new ceilings and they are gorgeous. We could not be happier with our experience with Pro Ceiling Tiles." "Ceiling tiles are perfect in our office. Great quality and delivered as promised. I commend the folks at Proceilingtiles.com on their willingness to make a mix up and shipping correct. Thanks again for a great buying experience"
"This is one of the best products I have used. The installation is great. We put crown molding with LED lights with 1"1/2 space and the ceiling looks stunning." Basement ceiling tiles face many different challenges. Basements can be damp and dark places that promote mold growth. Basements usually have very little headroom and any ceiling treatment needs to leave access to the plumbing and mechanical areas above it. Basements also bear the brunt of leaking plumbing when something goes wrong. Our basement ceiling tiles are the perfect solution to all these issues. Their PVC construction makes them 100% waterproof and mold and mildew resistant. Their flexibility allows them to be installed in tight places without the fear of breaking or damaging the tile. 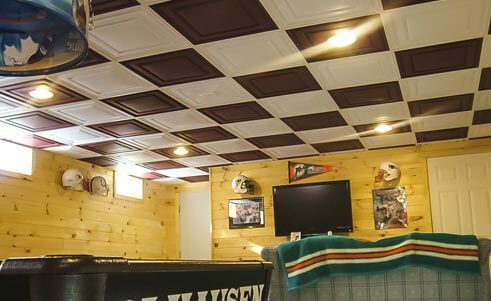 WIth over 200 colors and design combinations to choose from, we're sure you will find the perfect ceiling tile for your basement. 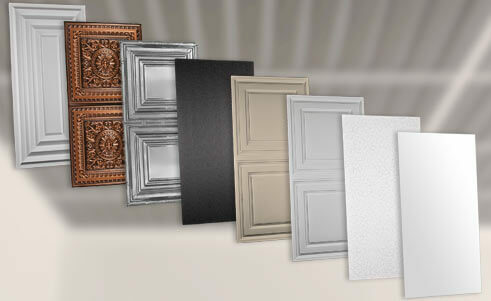 We offer the widest selection of ceiling tiles for drop ceilings. Choose from over 200 design and finish combinations, all manufactured to perfectly fit into your suspended ceiling system. 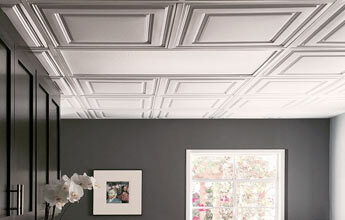 We have both 2x2 and 2x4 size ceiling tiles in stock and ready to ship right to your door. Our PVC vinyl constructed tiles are 100% waterproof, Class A fire rated, and available in several amazing styles and colors. No longer are ceiling tiles relegated to only being ugly, crumbly, stained mineral fiber tiles. Modern materials allow you to transform your ceiling into a work of art. 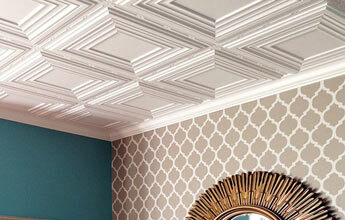 From subtle geometrics to enchanting coffered elegance, ceiling tile design has come a long way. Explore our eye catching designs coupled with amazing faux finishes that will leave you and your guests breathless, all at an amazing price point. Most styles are available in both drop ceiling grid mount or direct mount application. 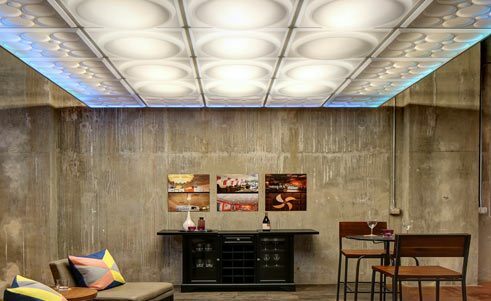 2x2 ceiling tiles have become the backbone of the industry and the size of choice for architects and interior designers alike. The symmetrical layout lends itself to practical installation solutions, while reducing shipping and manufacturing costs to consumers. 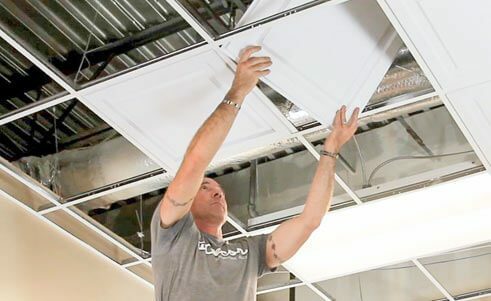 While not only aesthetically pleasing to the eye, the 2x2 sized ceiling tile is easy to handle and install. Most 2x4 grid systems can be retrofitted with a simple grid divider. While the market is gravitating to the 2x2 sized tiles, the 2x4 tile remains popular in industrial and commercial applications. 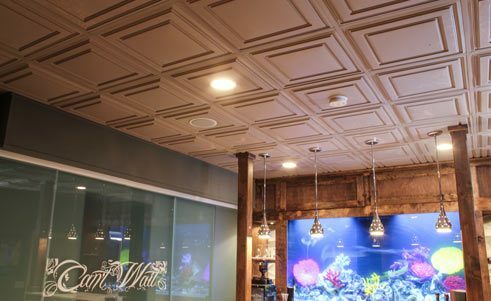 We carry several 2x4 ceiling tiles in designs that replicate the look of the 2x2 trend without the need to retrofit your existing installation. We also stock several styles that continue the traditional 2x4 look and feel allowing you to maintain a harmony with existing installs and decor.